As U.S. and Russian diplomats reached an agreement over the weekend to dismantle Syria’s chemical weapons stockpiles, the public expresses support for a diplomatic approach to the crisis but is skeptical about its effectiveness. By a 67% to 23% margin, the public approves of Barack Obama’s decision to delay military airstrikes and pursue a diplomatic effort to convince Syria to give up its chemical weapons. 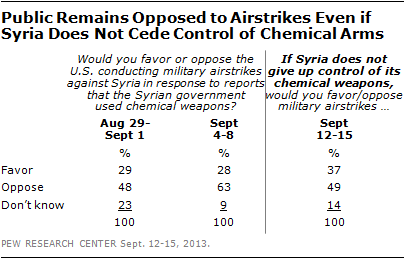 However, just 26% think Syria will give up control of its chemical weapons, while 57% think it will not. 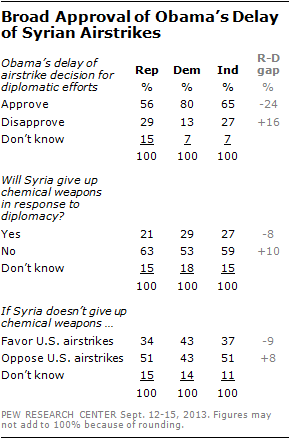 More generally, the public has little trust in Syria. Just 8% say the United States can trust Syria a great deal or a fair amount, while 63% say Syria cannot be trusted at all and another 22% say it can’t be trusted much. The public is skeptical of Russia as well: just 24% say the United States can trust Russia even a fair amount, down from 33% last year. The latest Pew Research Center survey was conducted Sept. 12-15 among 1,002 adults, as the United States and Russia concluded an agreement providing for inspection of Syria’s chemical weapons this fall, with destruction of the arms slated to begin next year. Because of the timing of the poll, it did not specifically ask about the U.S.-Russia agreement. The Obama administration has reiterated that military airstrikes are still possible if Syria does not cooperate fully with the disarmament process, but the public remains, on balance, opposed to the use of force even under these circumstances. Roughly half of Americans (49%) oppose the United States conducting military airstrikes against Syria if it does not give up its chemical weapons, while 37% favor airstrikes if Syria does not cede its chemical weapons. A week ago, before President Obama’s Sept. 10 address to the nation in which he asked Congress to postpone a vote authorizing the use of force against Syria, there was more opposition to U.S. airstrikes in Syria (63% opposed, 28% favored). Overall, more Americans (49%) say that in handling the situation in Syria, Obama has shown leadership and a willingness to adapt to changing circumstances. Fewer (35%) say he’s shown weakness and inconsistency. Far more Democrats (72%) than Republicans (26%) or independents (46%) say Obama has shown leadership in dealing with Syria. Democrats also are more likely than Republican or independents to approve of Obama’s decision to delay military airstrikes to pursue diplomatic efforts to persuade Syria to get rid of its chemical weapons. Still, majorities in all three groups – 80% of Democrats, 56% of Republicans and 65% of independents – approve of this approach. There is bipartisan skepticism that Syria will give up its chemical weapons in response to diplomatic efforts. About six-in-ten Republicans (63%) and independents (59%) express this view, as do 53% of Democrats. Democrats are divided over taking military action against Syria if it does not give up control of chemical weapons (43% favor/43% oppose). About half of Republicans and independents (51% each) oppose the use of airstrikes if Syria fails to relinquish control of its chemical weapons; smaller percentages (34% of Republicans, 37% of independents) favor the use of airstrikes under this circumstance. There is somewhat more support for military airstrikes among all three groups if Syria does not give up control of chemical weapons than there was a week ago, when the prospect of a failed diplomatic solution was not raised.